"And if your eye causes you to sin, pluck it out. It is better for you to enter the kingdom of God with one eye than to have two eyes and be thrown into hell, where "their worm does not die, and the fire is not quenched" (Mark 9:47-48). Jesus clearly believed hell is a place to avoid at all costs. Hell is not a state of mind, as many cults teach, but is a real place of punishment and torment. When we say that hell is a place of punishment we mean it is a place of perfect punishment. The unrepentant sinners will receive only the just penalty for their sins -- nothing more and nothing less than what is deserved. God is perfect in His judgments: "Say among the nations, 'The Lord reigns.' The world is firmly established, it cannot be moved; He will judge the peoples with equity" (Psalm 96:10). Hell is a place of eternal separation from God. Eternal separation does not mean that the sinner will not be in the presence of God. God is omnipresent, hell is part of His creation, so God is indeed present in hell. In hell the unregenerate person is separated from the grace of God. The Bible uses various illustrations to describe hell. 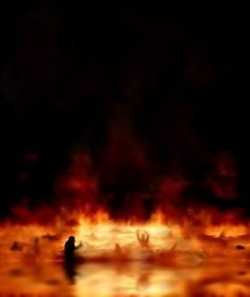 It is referred to as a place of outer darkness (Matthew 8:12), and as a lake of fire (Revelation 20:15). Clearly, hell is a place of incredible torment. It is not, as popular mythology claims, a place where Satan rules, and where angels and unrepentant men practice unrestrained sin. Instead, hell is a place of punishment where God does indeed have total control; where all those who have rejected Him -- angels and men alike -- will be subject to God's will. Christ came so that we might escape punishment in hell. On the cross He paid our penalty. Those who reject Christ's payment will one day pay the price themselves: "There is a judge for the one who rejects Me and does not accept My words; that very word which I spoke will condemn him at the last day" (John 12:48). "If your hand causes you to sin, cut it off. It is better for you to enter life maimed than with two hands to go into hell, where the fire never goes out" (Mark 9:43).